Today’s residential, commercial and industrial set-ups are heavily reliant on the continuous and efficient running of electrical and electronic systems. Over-voltage surges are a major cause of failure of these equipment. Such transient over-voltage surges are often generated due to direct/indirect effects of lightning strikes, switching of utility grid or capacitor banks, electrical accidents, turning on/off of nearby heavy load machines, AC chillers, motors, pumps, circuit-breaker tripping etc. Surges can cause destruction of electronic circuitry components, logic failures and breakdowns. Loss of operation, loss of service, loss of data, and loss of production can be huge and by far higher than the cost of damaged equipment. Long term exposure to lower level transient over-voltages can also lead to premature ageing of equipment. Havells offers a comprehensive range of Surge Protection Devices designed to protect your installation by limiting transient over-voltages and diverting surge currents to ground. MCBs for superior circuit protection. 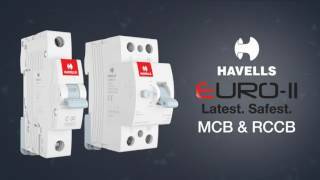 Suitable for copper as well as aluminium cables, every Havells MCB comes with a dual position DIN rail clip to allow changing a device from a device bank connected to a bus-bar, without disturbing the existing wiring.